11 Places on Earth No Human Has Ever Set Foot on | We Seek the Truth! Places on earth no human has ever set foot on. These are incredible locations and stunning spots which have never been touched before. The ocean is the least explored place on Earth, so it’s no wonder that vast portions have remained untouched by humans. One of those areas is Mariana Trench – a narrow fissure in the sea floor, located in the western part of the Pacific. The trench is the deepest known region on the planet and was formed millions of years ago. Hosting Chile’s wildest landscapes, the area hides untouched rainforests, peaks, rivers, and lakes. The field of northern Patagonia is also home to one of the largest masses of ice found outside of the polar region. Machapuchare is a sacred peak for the Hindu religion. It’s said that Lord Shiva, an important Hindu deity, lives here. The ‘Fish Tail Mountain’ gets its name from the shape of the peak as seen from a certain angle. A giant gaping cave was found in Canada in 2018 and it was named Sarlacc Pit, after the pit-dwelling beast in Star Wars. The discovery of the cave, concealed in the ground of the British Columbia’s Provincial Park, was a remarkable achievement for the explorers. Although we’ve reached to the sky in exploration, very few attempted to go in the other direction. We may know more today about stars and galaxies than we know about Earth’s oceans. There are more than 30 deep-sea trenches around the world and most can be found in the Pacific Ocean. In 2013 an expedition to the unexplored New Hebrides trench in the Pacific has revealed, with the help of high-tech cameras, the abundance of crustaceans and cusk eels that live more than 23,000 feet deep. The Star Mountains is a massive mountain range extending from the Indonesian border to the Hinderberg wall. It’s a network of huge limestone plateaus, up to 6,000 feet tall and 30 miles long, that protect the area. Mountains the size of the Alps have been found in Antarctica, entombed in ice – suggesting that the ice sheet formed more rapidly than scientists initially thought. Using gravity and radar sensors, maps were created showing details of the Gamburtsev subglacial mountains. There are thousands of cenotes all across Mexico’s Yucatan Peninsula, places that once were revered by the Mayans as sacred wells, and still an attraction for people worldwide. The Yucatan is characterized mainly by its limestone bedrock, a soluble type of rock that can dissolve after being exposed to water for millennia. The collapse of limestones sometimes reveals the cave underneath, thus marking the birth of a cenote. The caves fill over time with water filtered directly by the earth, creating lakes and stunning views. Since there aren’t many rivers in the Yucatan, they were once the primary source of water for the Mayans. Gangkhar Puensum, in translation ‘White Peak of the Three Spiritual Brothers’, is the highest mountain in Bhutan, with its peak reaching almost 25,000 feet. Most of the sources say that it’s located at the border with China. However, for many years, different maps would show it as various heights and even place it in completely different locations. It’s said to be the highest mountain in the world that has still not been fully summited by man. There have been four expeditions, none of them successful due to impassable terrain and sudden weather changes. One-fifth of Russia is covered by the Siberian Sakha Republic, also known as Yakutia. The major part is located above the Arctic Circle. The hard soil which is covered by permafrost, make Yakutia a deadly place to live. In July, some parts of Yakutia can reach up to 100 degrees Fahrenheit, whilst the average recorded temperature is as low as -50 degrees. Sahka is one of the few places on Earth where the mountains, rivers, and lakes are still untouched by civilization. 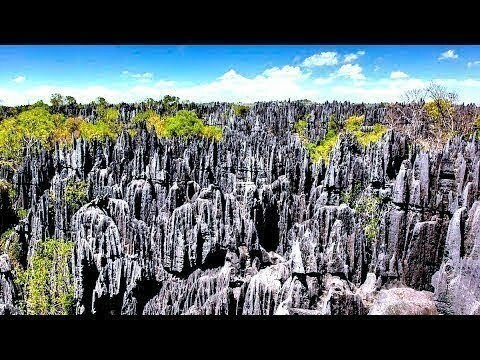 Tsingy de Bemahara, translating as ‘Where one cannot walk barefoot’, is a national park located in Madagascar covered in huge rock formations. With the help of the locals, a set of suspended bridges and steel cables was built, allowing the landscape to be seen from the air. However, getting to the park is still no easy feat. Located on the remote west coast of Madagascar, Tsingy de Bemahara is only accessible by a dirt road, which becomes unnavigable for six months a year during the rainy season.